Enter this intergalactic space vortex at Wizard and travel through time and space until you emerge onto the other side of 5 reel slot game paradise. Win cash rewards by mixing molecules and chemical formulas where you can play super science themed bonus rounds where you can gain multiplier, side reels and bonus wilds to generate huge wins. Based in Stockholm, Elk Studios opened an office in September 2013 and launched their first slot, The Lab, October the following year. They admit a great passion for games. Now, fourteen slot games online and almost four years since their first outing, Elk continue to forge a clear path in the gaming world. They work with statistical models to create beautiful art and bring their gaming characters to life using advanced algorithms. While thousands of gamers around the world are playing their games, their servers generate hundreds of transaction per second. Various areas of online gaming are crowded, or dare I say, overcrowded with offerings harbouring the same theme, albeit they are presented differently. Then along comes a theme that makes you pause. The Lab was the first slot developed by Elk Studios and was released in October 2014. Its theme is science. And they made it attractive, and even fun! No wonder it attracted lots of players, making it one of the popular and best video slot games ever! You don’t have to be a math-loving nerd to be attracted to this futuristic offering. Get your protective clothing, latex gloves and step into The Lab. Elk could have taken an obvious route and decorated the five reels with receptacles, burners and the like, but it’s not about the instruments, more the compounds. Think about what happens when certain compounds are mixed - BOOM! And here boom equals wins and boosts! In The Lab, you will find a five reeled roller with 15 pay lines. This is low compared to the usual 20 - 25 pay lines. Compounds and coded terminology litter the reels and we have gorgeous looking crystal molecules, precious matter and minerals. Coded shorthand such as 02 (Oxygen) Au (Gold), 02 (water) and Pt (Platinum) I admit, I had to look up that one, fill out the rest. Out of the two, it is the crystals that pay higher than the chemical elements. The big guy here is the green gem - line up five of these and you'll create a bubbling 500 coin pay off. With other potential wins up to an explosive 46,000 coins, you'll understand why The Lab can be a volatile place. The Lab is easy to look at and the transparent reels reveal a swirling vortex and this pretty addition, aligned with the centre symbol on the second reel, has a purpose which we will come to later. All the while a neat, sci-fi sounding tune compliments play. There are 2 ‘trigger' symbols the game title The Lab is one, the other an ‘X'. The X scatter promotes a nice win boost of 2x for each X symbol that appears. 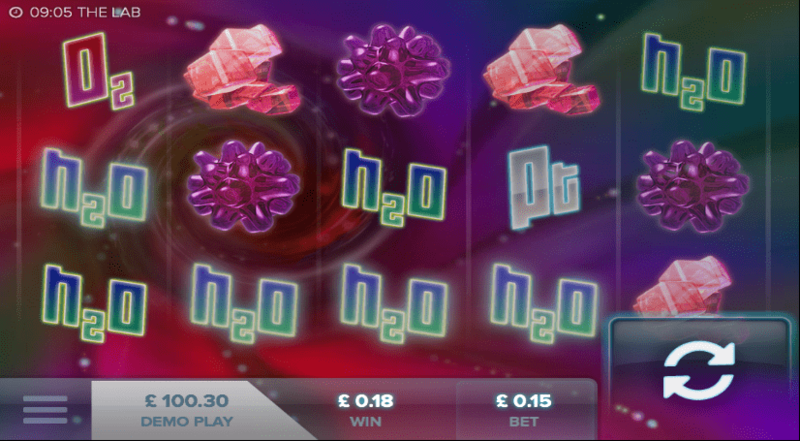 There is also a free spins bonus feature and all wins are doubled. The title symbol The Lab is the key to triggering this bonus feature. It sits on the second reel, second row and when stops over the vortex - boom and you have a respectable 10 free spins. You can add further free spins if additional +1 / +2 symbols appear. During the free spins, The Lab symbol becomes a wild and subs for other symbols except the X scatter. Multipliers work during the free spins and any winning pay lines are automatically doubled. As noted it is a pleasing visual, but overall lacks any real creativity in its setting. Neat and tidy, beneath the reels you have an options box and here you can alter settings and read through the games win values and strategies. There’s also an auto play option. Next to that your balance, your win total and your bet setting. Click on the bet button and up slides a panel offering selection of other betting options ranging from 0.15 to £90. For the full range of website promotions please click here. It is the daring choice of science for its theme that attracts attention. The play is smooth and clean resembling elements of precision in the world of science. Although three years old, The Lab maintains relevance and should still be viewed as a worthwhile addition to the online casino. Likely to attract a certain player looking for something a little different it has the potential to become a cult favourite with online gamers. Another wacky game is mad mad monkey slot.